Shooting Tips – Detect Excessive Pressure – Pennsylvania: Hunt. Fish. Shoot. TECH TALK–How to Detect Excessive Pressure in Your Cases: Reader ScottyS provided this comparison photo of cases, showing the tell-tale signs of over-pressure. Scotty tells us: “These samples were from a lot of Federal soft-point hunting ammunition that were fired in a custom .308 with a chamber on the tight side (although still allowing a .308 Winchester GO gauge). Among the pressure symptoms were heavy recoil, sticky bolt lift, and the left case had to be manually removed from the boltface. This demonstrates why: 1) you should never assume that all lots of factory ammo are the same (and safe); and 2) you should ALWAYS wear eye protection. 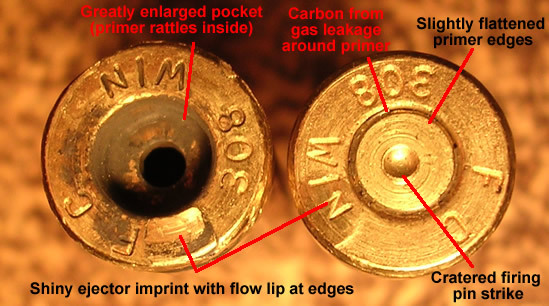 This also shows how high pressure can spike once you approach maximum load levels.” Scotty noted that there was a big pressure difference between the left case and the right case, although both were fired sequentially, and both were from the same lot of ammo. So take heed–always take precautions when testing new ammo, even if it is factory-loaded.